Below are supplies your puppy may need or want so it's best to have most supplies ahead of time. Be sure to order the puppy training kit today so you can get familiar with it so you will be ready for your puppy. You don't need to order the exact brands on photos but we have taken the time to put direct links to these products for ease of online shopping. You will definitely want a collar, leash, crate or carrier, and water for your trip home. Even if we don't have your dream puppy now, feel free to view our site and information and get some supplies here. You will want to get a small collar. Avoid cheap plastic buckles as they crack and don't always lock tight, but worse, they can pop undone. ​A harness is good for taking your puppy for a walk or to learn to potty outside. A collar is best for training sessions. 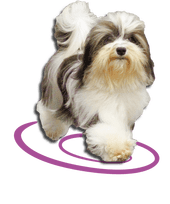 If choosing this harness, a havanese puppy usually fits a small, while a mini poodle puppy might start with a medium (toy breed harnesses only.) To determine what size harness you'll need, measure around the chest of the puppy and then look to see what size the manufacturer is suggesting you get. Each manufacturer will have their own measurement chart to use as a guide. A 4-6 foot lightweight leash should work great. We do NOT recommend a flexi leash. It can be hard to gain control in an emergency. They can get attacked or hit by cars much easier with the flexi. So please stick with a regular leash. Food and water dishes. Ceramic or stainless steel. They last and don't hold germs. May want a second set to hang in crate if you need them. For puppies who get wet face, play in water bowl, or dump it, drink too fast, try the water bottle. 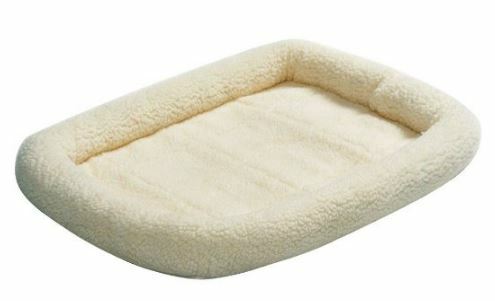 Bed to sleep in, and maybe a pad or something for the crate. They also like Pipebeds to lay in. Perfect for in the crate. 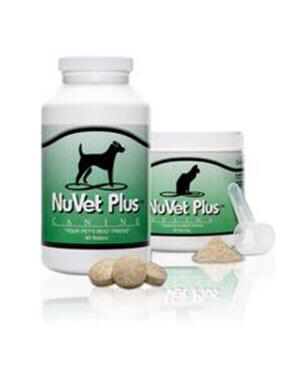 We feed Raw and fresh Pet/Vital. We recommend Origens, Stella & Chewy's, Wellness CORE, Merrick, or Primal is great food too. The fresh pet and vital are refrigerated food and must be bought at the pet store or some Walmarts. Dry food can be free feed, but raw or wet, needs to be fed 2-3 times daily for young puppies. We recommend feeding same times each day, puppies do best on routines and housebreak faster that way too. Treats should be natural, quality, and small. We like hotdogs, fresh chicken, cheese, meat, or other healthy puppy treats. But break into tiny pieces so that they will still eat dinner as you don't want the puppy filled up on treats alone. We highly recommend the Happy Puppy Training Kit. It is a great way to quickly and correctly train your puppy. Chart the progress, easy to view and understand with pics so kids can understand too. Totally done with positive training. Learn to read body language and prevent bad behavior issues. Better then any puppy training classes or books I've seen. Click photo to right to learn more. Plastic or wire cage to transport and housebreaking. Small crate or one with divider. Do not get a huge crate, puppy will potty in it then. Ask us, we sometimes have some new ones we get on sales available to sell you. An 18x24" wire crate will fit our adults. Add divider till he/she grows. Airline approved bag if your flying with your puppy. Puppies love toys. Favorites are cat tunnels, plastic water bottles, flat unstuffed toys, and toys that Crinkle. Big or small, they love them all. ​Chews we recommend are hooves, and natural bones. NEVER raw hides. ​This is a pen to confine puppy to specific area. We use these with the litterbox for ease of training. It keeps your puppy confined to a safe area when your not able to be right there supervising. Wire one like in photo or a child's play yard works too. Works wonderful outside in yard to teach to potty inside it. Most our puppies are litter box trained when you get them. If you want to housebreak to go outside completely, do NOT get a litterbox or potty pad. Use the crate when your not supervising. Litterbox I use a storage container that is fairly tall and cut a door into it. But a cat box will work too. For litter I use Pine Pellet Horse Bedding (sold at feed stores for horses). But the recycled paper litter will work too. Do NOT use regular cat litter. Or you can use potty pads or grass pads in place of litterbox. however puppies will play with the disposable potty pads, washable ones work better. We highly recommend a tooth brush and tooth paste to maintain puppies teeth. If you don't brush there teeth you will need to take to vet for once or twice a year for dental cleanings at huge expense. So get in the habit to brush teeth right away, even on the baby teeth. If you don't keep tarter under control, they can developed heart issues and gum diseases. 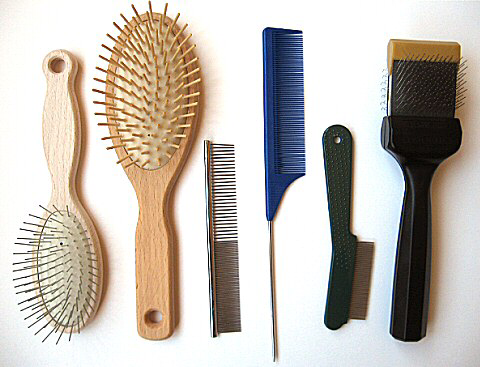 ​A metal comb to comb hair down and check you got matts out. A natural not harsh shampoo is best. ​We love Mircle II as it is super duper safe and doubles as a super safe cleaner for around the house! Espana, pure paws, and many other wonderful kinds out there. Whitening is fine for dogs with white.